Clean Energy Consumption with Captive Solar Power Plant& Conservation of Water. Diversified Product Range to serve multiple Industries such as Automotive and Electrical & Electronic Appliances apart from host of other Industries! Ahmedabad, 7th February, 2018 – Calco Poly Technik is India’s fastest growing enterprise, providing its Customers with value added products, services and innovative solutions encompassing product development in different market verticals. Calco Exports its wide range of products to SAARC, South East Asia & European countries. Since 1999, the Calco Group has set itself apart with sublime focus in maintaining Superior Product Quality and seeking new opportunities for Research & Development. Calco (provides) complete range of High Performance Polymers, color and additives solutions, meeting the most critical operational requirements and technical specifications. The manufacturing process relies on Slim-Line, High Degree of Automation, and Flexible Utilization of the Production Facility. Mr. Vijay Kumar Gupta, Founder & MD, Calco Group said, “The Calco Group with a turnover of over Rs1000 Millions has reinforced its contribution in the Plastic Industry by setting up its 2ndPlant at, Haryana with an investment of over Rs 500 Millions. It would be a state of the art production facility with World Class material handling equipments in a built up area of 100,000 sq. feet, planned to be up and running by end of 2018. As a part of Commitment to Prime Minister of India’s initiative ‘Swachh Bharat Abhiyaan’, we have Commercialized Indigenous Technology on Eco Friendly Plastic, in Collaboration with The Defence Research and Development Organisation (DRDO), an agency of the Republic of India, charged with the Military's Research and Development, Ministry of Defense Govt. of India. Speaking on the occasion, Mr. Varun Gupta, Director, Calco Poly Technik said, “The optimism for developing niche specialty Polymer Products is driven by our technology and R&D capabilities. Calco Team is inspired to transform its business from commodity led to knowledge driven. Calco Poly Technik focuses on developing a strong Product Portfolio and work on innovative solutions to further strengthen customer relationship and build partnerships with Global Players. He also added, “With more than 500 customers across all segments, 90 % of Total Sales are powered by the Automotive and Electrical & Electronics segment. By the end of 2020, the Compound Annual Growth Rate will observe 30%Inflation with total production capacity of 30,000MT/Year, total area of 100,000 Sq. Feet, and estimated sales of Rs 2500 Million. 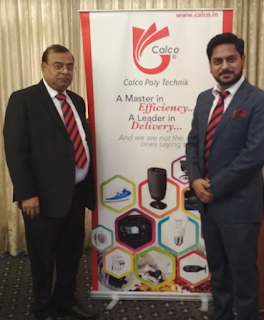 Vision of Calco Poly Technik is to be India’s Most Preferred Global Plastic Solution Provider, through growth and enrichment to its Associates and the Community in which it operates. It also aims to further strengthen its relationships with OEMs & Tier – I / II Industry. Calco Poly Technik at present caters to its Customers from diverse Industries viz. Automotive, Electrical & Electronics, Appliances and Industrial Goods …to name a few!